City of Outlaws Game: A lot of people want to get richer over night. Because that is impossible with decent and hard work. Some decide to do it differently, that is to say, they look for the easier way. Than gangs are formed, they are all over the cities and even have their quarts where no one can touch them. But justice must be reached, and they will get punished sooner or later. That’s why there is the police and investigators whose job is to fight for the good and put away the criminals. Sometimes they are not simple to be caught, they will give you trouble and headaches. But maybe that is the whole truth, those criminals are the most provocative for detectives. Karen and Donald are private detectives who are hired from the owners of one private company, that for several time is target of the thieves that exist here. They can not stand this anymore, because a lot of precious objects have been stolen from their company. Karen and Donald are here with their team and they will try to find the thieves. We are sure you would like to be a detective for one day, won’t you? 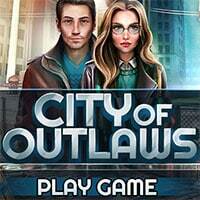 Enjoy and have fun in playing City of Outlaws Game. Good luck.